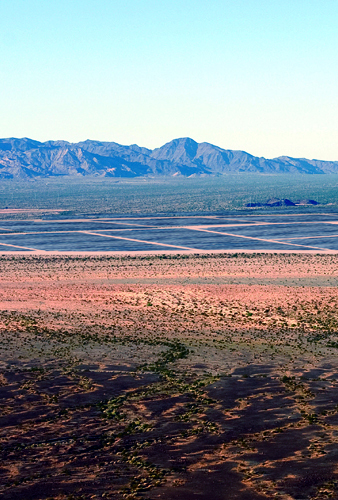 The Desert Harvest Solar Project is a solar photovoltaic facility that will generate 150 megawatts of electricity on an approximately 1,200-acre site characterized by undeveloped, non-agricultural land managed by the California Desert District of the U.S. Bureau of Land Management (BLM). The project is located south of and adjacent to the Desert Sunlight Solar Project and just north of the town of Desert Center in Riverside County. The project includes a proposed solar field as well as a 220-kilivolt gen-tie line to transmit the electricity generated to the regional transmission system through the Red Bluff Substation, where the power from the proposed solar facility would be stepped up and fed into Southern California Edison’s existing Devers Palo Verde No. 1 high-voltage transmission line. Aspen prepared an Environmental Impact Statement (EIS) for compliance with the National Environmental Policy Act, as well as supporting technical analyses. Riverside County has the authority to issue local permits for the gen-tie line so the EIS has been prepared to a standard that complies with all requirements of the California Environmental Quality Act (CEQA) under Section 15221 of the CEQA Guidelines. Aspen also provided project development support, including but not limited to: management of teams of biologists and archeologists in performing surveys for special-status wildlife species, rare plants, and cultural resources; preparation of the project’s Plan of Development; consultation and advice regarding transmission interconnection solutions; coordination with the BLM and regulatory agencies.